http://bit.ly/1m1whzU . PLEASE UPDATE ANY BOOKMARKS YOU MAY HAVE. Link to the code for the analysis program is given at the very end. For this analysis, we ignore the 2012 Rank column. A description of the variables and the methodology is provided in the article here and here. 124 schools have been ranked. One thing to note is the following. The 2013 rank is based on an index number they computed, with 100 being the highest (for the first ranked school, Notre Dame) and 20.35 being the lowest score, for California-Riverside, which was ranked 124. So, when it comes to a rank of a school, lower is better; for index numbers, higher the better. something to keep in mind for understanding results. How many schools are ranked in different States? 1. Ohio has the highest number of schools represented in this ranking. 2. There are few states, which are not represented in the ranking. Remember, a school with a higher index number was better ranked. 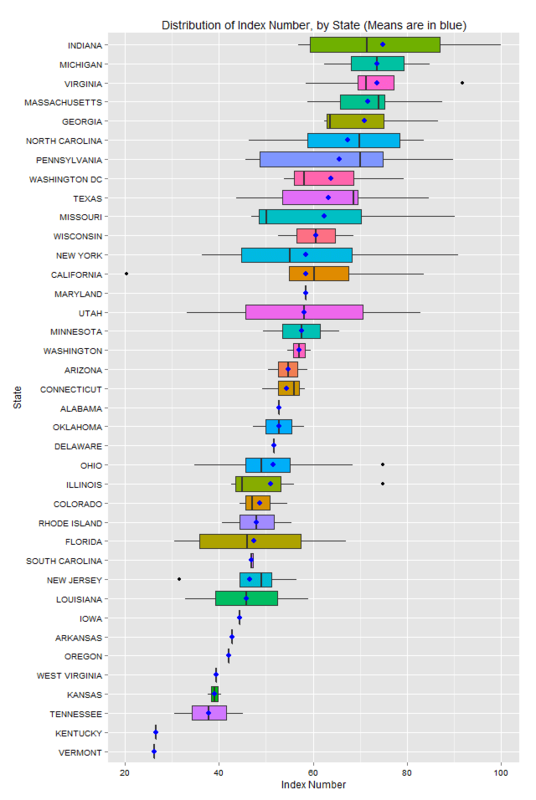 Here, we look at how index numbers were distributed across different states. To do this, we use boxplots, which show the minimum, maximum, 25th percentile, 50th percentile (median), and the 75th percentile of the distribution. The blue dots in the middle of the box are the mean index scores. 1. Average scores are increasing from Vermont to Indiana. 2. Spread of the distribution (to some extent, measured by how long each box is) appears to vary across different states (for states with only one school, it is just a single point, but for states with multiple schools, the spread indicates the higher variance in the index scores across schools in that state. 1. As one should expect, job placement grade and teaching quality grade matter. 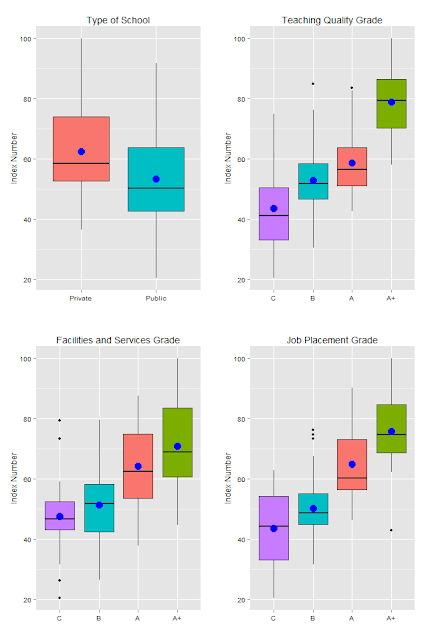 Facilities and services grade also has an effect. 2. Private schools appear to have a higher index number than public schools. Here, we will look at a correlation analysis. (I've clubbed rank-ordered variables with ratio-scaled ones, but come on.) Below, is a graph with correlation coefficients color coded based on their value. Positive coefficients have been coded in blue and negative ones in red. Intensity of colors indicate the value. 2. 2013 Rank is perfectly negatively related to Index Number (hence the , because of the way it is computed). 3. Index Number is marginally positively correlated with Annual Tuition (not a good thing, is it? 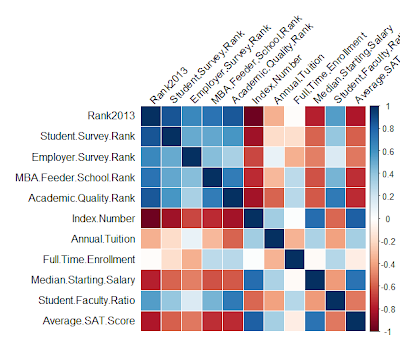 ), but has a positive relationship with median starting salary of students. The latter relationship is a good thing. 4. 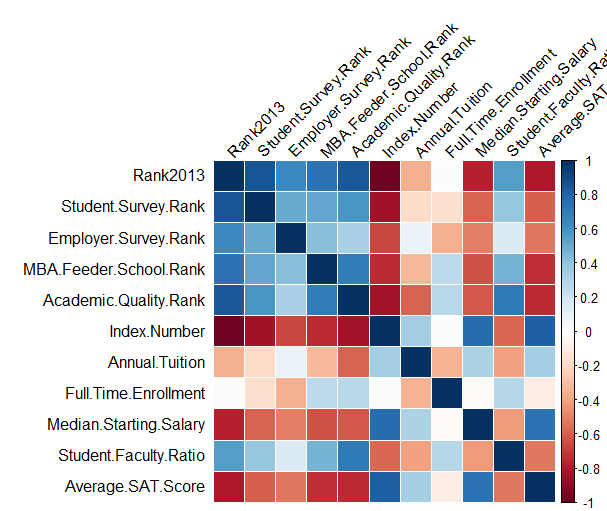 Index number is negatively related to student faculty ratio, which is also a good thing, right? How does this play into the MOOCs thing? 5. And yes, the average SAT scores are strongly related to the index number. Now, this gets interesting. Since there are many combinations possible and everyone has their own pet set of issues, the following interactive chart will let you play around until .... forever, if you are really ticked about these issues. This chart can be played around with in the following ways. 3. You can hover over the dots to know the school and value of the variables being examined. 4. Color is used to identify whether a school is a public school (Green) or a private one (Blue). 5. Size of dot is based on the index number- LARGER size is a better ranked school with a higher index number. Observations: I will let you make them. Have fun. The R code for this analysis can be accessed by clicking this link.